Like many landlords these days, Edens is keeping a close eye on the changes sweeping through the retail sector. That job just got a little easier, thanks to the firm’s relocated regional headquarters in Washington, D.C., which gives Edens a front-row seat on the everyday challenges and opportunities facing urban retailers. Edens is putting the finishing touches on the conversion of a 22,000-square-foot warehouse that will house its own offices and two ground-floor retail tenants, in the up-and-coming Union Market area of Washington. Edens has said that it hopes to use the property as a “learning lab” for better understanding retailers and consumers alike. Edens began relocating nearly 100 employees on May 1 from its current location in Bethesda, Md., to the renovated building at 1272 Fifth St. N.E. The latter building, which opened in the 1930s, was originally part of a farmers market. These days the Union Market neighborhood is gaining attention as a developing area that is seeing an influx of residents and, along with them, new restaurants and shops. One particularly upward-trending spot is the Union Market artisanal food market, home to roughly 40 local vendors. Edens decided to relocate to this urban neighborhood because the company wanted to give its employees a more interesting, vibrant workplace in an area known for creativity and which boasts a diverse business base where entrepreneurs are locating alongside more-established enterprises. 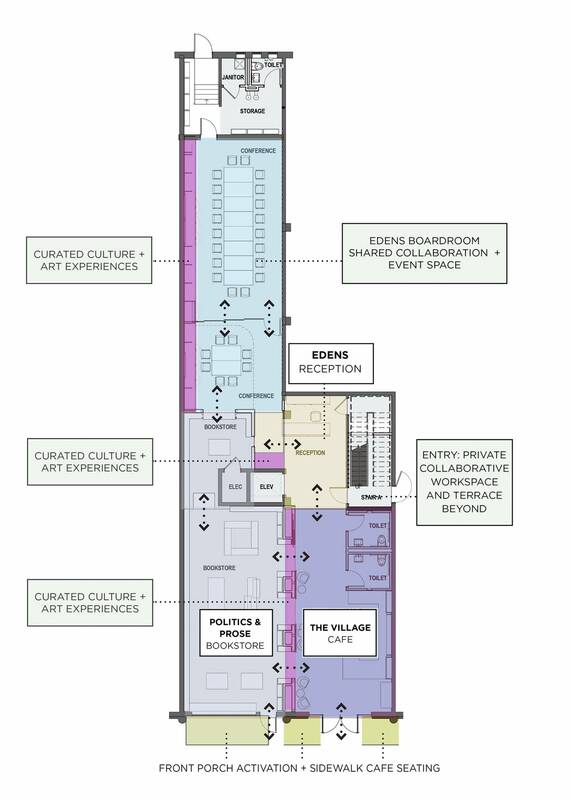 The Edens offices will be housed on the second floor, along with the two retail tenants: the Politics & Prose bookshop and Village Café. “As retail is constantly changing and evolving, we wanted to really merge ourselves fully into the businesses of people we do business with every day,” said McLean. Edens is locating its boardroom on the ground floor. The company intends to use the space during the week and then, in a nod to the “sharing economy” trend, make it available to Politics & Prose for special events on evenings and weekends. Union Market is the fourth Washington location for Politics & Prose, an independent bookstore that has been operating in this metro for 34 years. The bookstore will occupy about 1,000 square feet of retail space, with access to an additional 1,000 square feet shared with Edens. 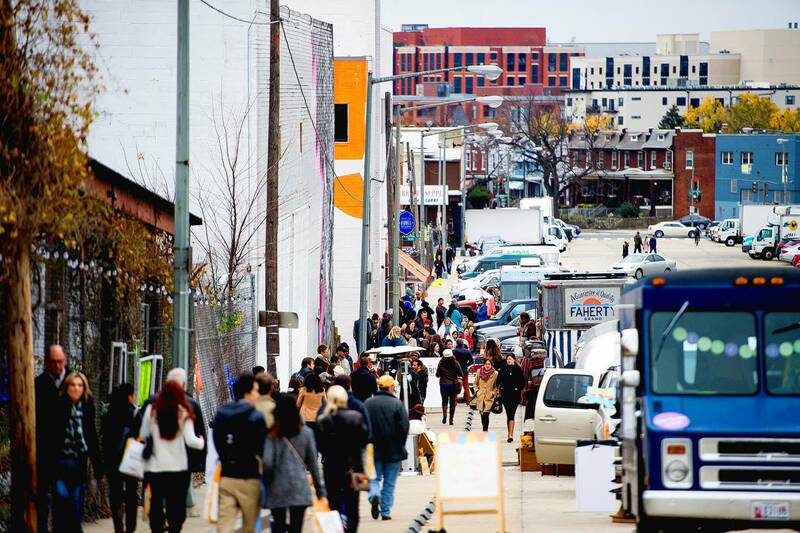 “What interests us about the Union Market district is how the area is being revived as an attractive mix of residential, commercial and retail spaces,” said Bradley Graham, a Politics & Prose co-owner. “Opening a branch in the Union Market district at a time when much of the area is still undergoing redevelopment will enable Politics & Prose to start early to contribute to a new sense of community." Politics & Prose is set to open late this month or early next, followed by the opening of Village Café in mid- to late June. This is the first location for startup Village Café, whose operators seek to run as a culinary incubator for the area, offering locally sourced products. “This is a perfect startup place for establishing what The Village Café is about: a community-driven café dedicated to serving and showcasing products from underserved communities,” said Kevon King, the eatery’s owner and a co-founder. “Not many places in the city are doing something quite like this, with these types of entities mixing to create something fresh and community-driven. It gives us all a chance to grow with each other." The design, location and amenities of this new regional headquarters site also reflect the changes occurring in the contemporary workplace. People want to be able to go seamlessly from their jobs to the places where they pursue personal activities, for one thing. The effort to understand these changes and to incorporate them into Eden’s company culture was a motivation behind the move to the new headquarters, McLean says. The offices will embody an open floor plan and a 1,200-square-foot rooftop terrace. This regional headquarters site is one of six the company has around the country.